It’s been a few weeks and the spice grinder that I am so sure we bought at Target has not turned up. Bookman stopped at Target on the way to work the other morning to pick something up and thought he’d get a spice grinder too since we couldn’t find it anywhere. He looked around the kitchen tools area for a bit before flagging down a store employee to ask where they kept them. “Spice grinder?” said the employee, “we don’t sell them.” When Bookman told me this I wanted to sputter that it couldn’t be right, the person he talked to didn’t know anything because we had already bought one from Target! But all things considered, I had to admit defeat. Ouch. extensive and fabulous bulk spice aisle they sell all sorts of marvelous things including spice grinders. It sat on the shelf next to a lovely marble mortar and pestle. I tried to hint that maybe we want the mortar and pestle instead because — pretty! — and very old fashioned cool, something a kitchen wizard should definitely have. Bookman was so busy scooping powdered onion into a bag that he just sort of grunted at me. I took that to mean you’re kidding right? So I reluctantly put the spice grinder into our cart and left the mortar and pestle on the shelf. One day, maybe. Later at home I am looking at this little spice grinder packaging and it cracks me up. On the sides of the box in big letters it says Spice it Up! and Tulip Spice Grinder great for flax seed. And then in little print right above where it says spice grinder, it says ideal size for grinding spices. Really? Doesn’t that kind of go without saying cuz it’s a spice grinder and aren’t they all pretty much the same size? I have no idea why I find this so funny but see note earlier about the wild life I lead for a possible explanation. Now we really do have a spice grinder and we can grind up and use the black cumin we grew in our garden. Yay! I swallowed my pride and told Bookman I had been mistaken about having bought a spice grinder at Target. He was kind enough to only gloat a little. We had six days in a row this week with temperatures over 90F (32C) and tropical humidity. One night it only cooled off to 81F (27C). Friday we “cooled off” to 88 (31) and then got hot again Saturday. But the heat finally broke last night and we even got rain. Today has been cloudy and a cool 73 (22). Until last night we hadn’t had rain in so long our rain barrel was bone dry. With the heat we had to water the garden every day from the hose. I do not look forward to the water bill. But even though we watered, the garden suffered. Bossy and Bingo dropped lots of apples and Bea, our honeycrisp that had one apple on her, well, it fell off too. Even Walter the crab apple dropped two of his four apples. The beans hung on as best they could but were pretty stressed and didn’t produce as many beans this week as in the past. Some of the beans that were really small shriveled up and went crispy. There aren’t many flowers on the plants anymore so I think I will get a few beans next week and that just might be it. 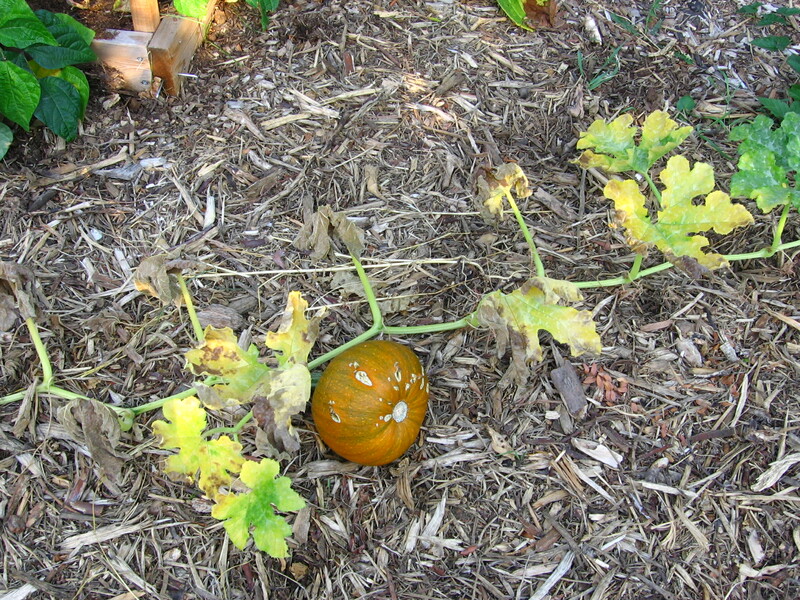 The plants that suffered most were the pumpkins. Those big leaves can’t take hot sun beating down on them. The whole vine did not die but the bigger leaves all did. So sad looking, poor things. but they got bigger. The bell peppers, we only have two, also got bigger as did the cantaloupes which are all still small and so far behind that I am not sure they will ripen before frost. The morning glories exploded. 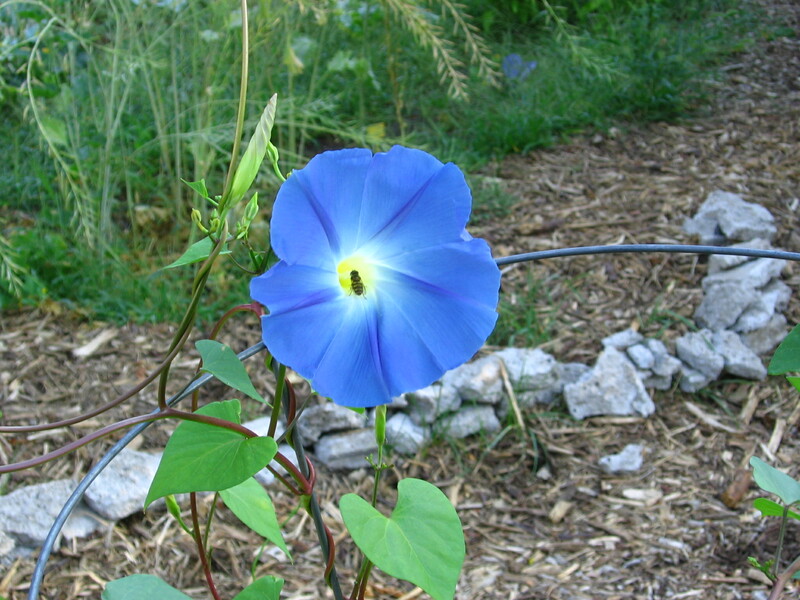 We only planted heavenly blue, the rest in the yard are seeded from last summer and they are everywhere. It’s crazy fun. 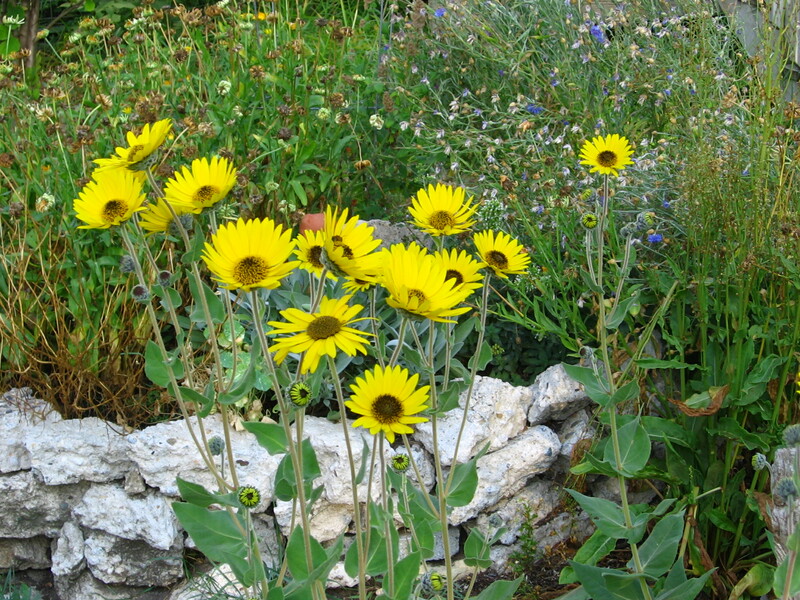 This week the downy sunflower, a native perennial sunflower, burst into bloom. It doesn’t mind the heat at all. And the garlic chives are going crazy too. 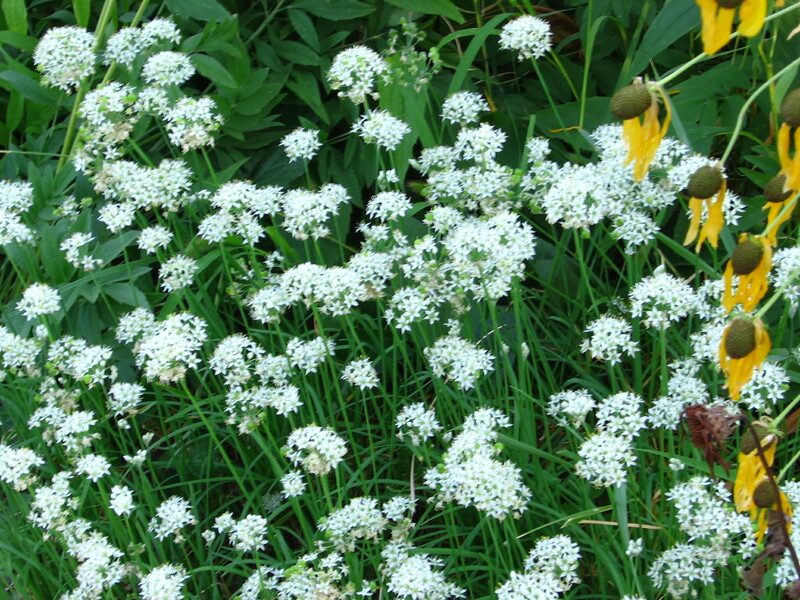 I know lots of people complain that these are invasive and yes, they do get out of control and seed themselves everywhere, but there are so few white flowers in my garden that I very much like them. Plus they seem to be able to grow anywhere, like a weed. Better to have a plant that isn’t a weed and that I can actually use for cooking growing like a weed than one that is a weed going crazy everywhere. With today’s cool weather Bookman and I spent some time working on the garden path and it is almost done. Tomorrow is a holiday and supposed to be cool as well so I think we just might finish it. If we do, I’ll have a picture of it next week. Yay! I enjoyed your dispatch from the spice grinder wars……seems pretty wild to me! I am glad you have had a break from the miserable (if you’re not a tomato) heat. In UK we have actually had quite a nice summer though in South it was perhaps a bit torrid. Ian, I know, crazy wild, right? 😉 We were so glad when the heat broke. Overall the summer has been decent here but for a heat wave at the beginning and one at the end. I hope it is done with now. Glad your summer has been pretty nice! I have to side with Bookman on the mortar + pestle vs spice grinder war. I have painful memories of grinding cardamom seeds for waaay too long using a mortar. smithereens, I do have to agree the grinder is much more efficient than a mortar and since I am not the one who cooks, I must give in. Oh yes, the huge garlic flower balls are really pretty. I should think about getting some one those! I had an adorable mortar and pestle for decades. White ceramic. When Katharine was home for Christmas she saw it on the counter and said, “Oh, I remember this. I’ve always loved this, Mom. Ohhhh it’s so adorable. Oh!” Well, what could I do? It’s her mortar and pestle now. I need to replace it, though, but I got so used to its feel and size that I have to find one close enough to that one before I jump. I do have a spice grinder (actually, it’s supposed to be a coffee bean grinder but it works for spices very well.) My garden is totally pffsst. I harvested one more red pepper and a sorry looking eggplant. Thank goodness for the produce stand and the Farmers Market. Grad, you are so very nice to let Katharine have you mortar and pestle. I hope you are able to find the perfect replacement. Sorry your garden is done already. Mine is definitely winding down. Or maybe it’s me who is winding down? Interesting… a spice grinder that’s great for grinding spices. LOL. Glad you’re beginning to harvest. Today we get quite cool, leaves turning yellow, and some fallen off trees. I’m afraid it’s the end of summer already. Arti, I know, what an idea, right!? No leaves turning here yet but it won’t be long. Even though we still have some warm days ahead in the forecast, the geese are flying, the monarchs are passing through and there is a definite whiff of fall in the air. Too funny about the spice grinder! Unfortunately sometimes the obvious is not so obvious to everyone I guess? I own a mortar and pestle, though I am not much into cooking these days and am not quite sure where it is….and now I wonder what I originally wanted to use it for….how bad! I’m envious of your coop–though I just in the last few weeks managed to go to a local Whole Foods and it was like stepping into paradise! 🙂 Do you ever cut your flowers and leave them in vases in your house?